I have still barely recovered from our annual trip to the cottage. For the past three years, we take a trip to Collingwood with my husband’s sister and her family for a fun-filled week of “relaxation”. I use quotations because anyone in their right mind knows that going anywhere with four kids (aged 3, 5, 6 and 10) is anything but relaxing. They don’t sleep because they are not on their regular routine, or in their regular beds, or they have to share a bed with their sibling. They don’t stop asking to do things, even when we are in the middle of doing things. Not to mention all the stuff we have to pack and bring, unpack and entertain, and re-pack and bring home. So to say I’m exhausted, would be an understatement. I think that’s why it’s taken me over a week of being back to reality to find some time to write again. All that being said, the kids had a blast together. It’s so nice that they all get along and can play together – even if it’s on a phone or tablet sitting beside each other on the couch! We stayed about 10 minutes from Blue Mountain, so we made sure to visit and take a ride on the Ridge Runner, have some ice cream and of course, a famous Beaver Tail. The kids all enjoyed that very much. 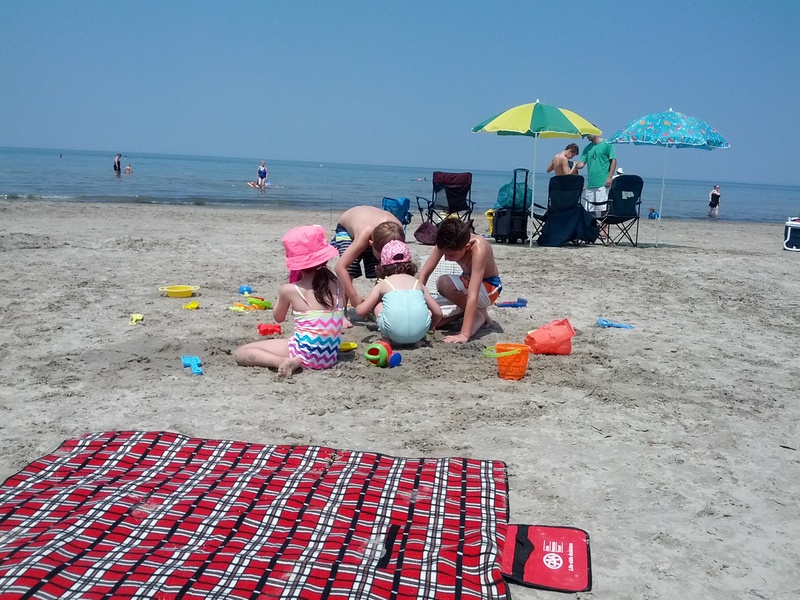 We even spent a day at Wasaga Beach, which the kids loved! The Little Mouse loved making sand castles and the Little Bird spent lots of time in the water with the Paxter and GamerBoy. We went to the pool a lot, as all the kids loved to splash around and play and we tried numerous attempts and tactics to get the Little Bird to jump in. None of which were successful. We had a few nights of eating out, but mostly took turns cooking and while we tried to get them to go to bed at a reasonable time; which didn’t always work. So we had little sleep. My kids especially like getting up early, and since they slept on an inflatable mattress in our room, they were up even earlier thanks to a couple of uncovered triangular windows that are in the room. In the day, they let in wonderful light and look aesthetically pleasing, however first thing in the morning, I wish they had shades. 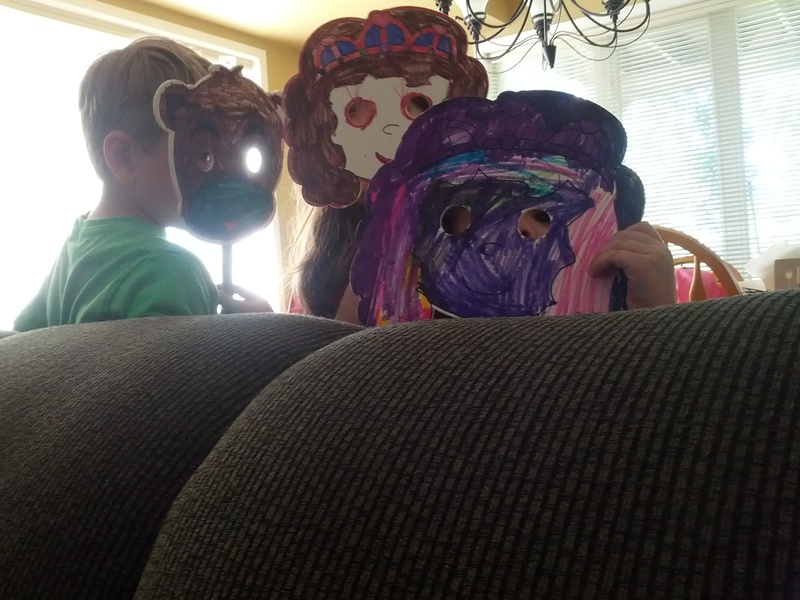 I had to wear an eye mask, but of course the kids didn’t, so when the sun came up, they were up too. As early as the roosters (or Geese, in our case). Speaking of Geese, I’m all for nature and wildlife, however the neighbour of this cottage has taken a liking to feeding the Geese, birds, squirrels and chipmunks. 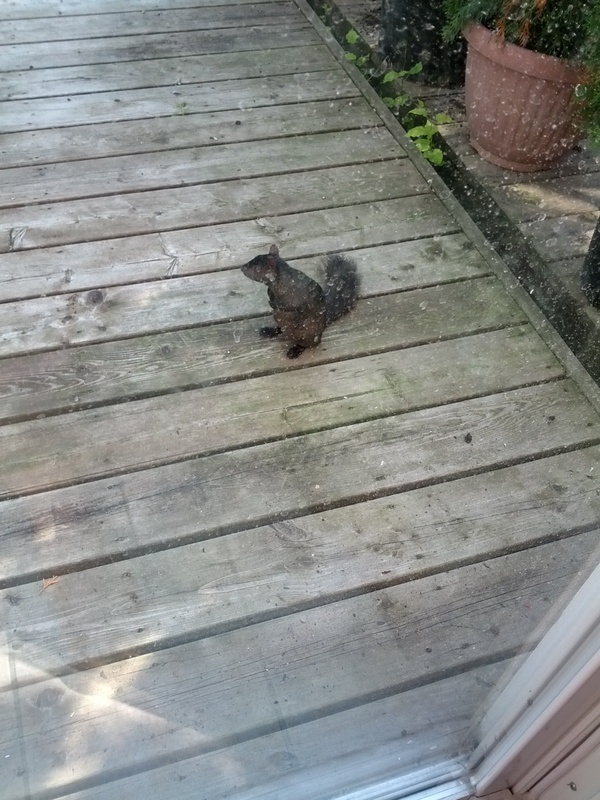 So on our first day we woke up to find a squirrel putting on a show on the back deck, hoping for some food. 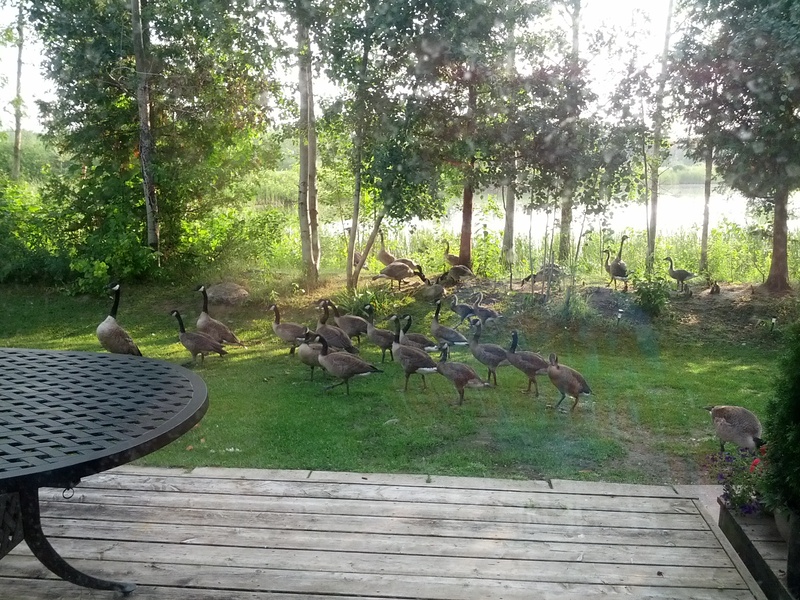 Shortly after that, I saw about 30 or more Geese come out of the pond and right up to the back deck as the neighbour threw out seeds and feed. Chipmunks quickly sprinted back and forth collecting what they could during all the commotion. Just some of the geese waiting for food. This feeding frenzy continued throughout the week, which meant that the kids were not going outside. There was a big mess – if you know what I mean – out there. And watching the Geese attack each other for food, meant that our little ones were not safe. So that meant that we had to entertain them, or find ways for them to entertain themselves during those non-pool hours. With four adults and four kids in the house, we had four cell phones, one iPad, one Tablet, a Wii, LeapPad, VTech tablet and iPod. Talk about being connected! We also had crafts, games, cards, colouring books, reading books and movies. There was always something to do, even if the electronics won every time. In the middle of the week we took a weather-forced break from the pool and beach and went to watch a movie. The Little Mouse fell asleep on my lap, which is what usually happens. By the weeks’ end we were in full-fledged Elvis Festival mode. Collingwood was buzzing with activity and when thunderstorms threatened to ruin our last day there, we decided to take our chances at the fair, and see what all the commotion was about. The sun peaked out and the kids enjoyed rides and games. Overall it was a great week for the kids, even if it was exhausting for us. But these are the things we do for our kids right? With summer half over, do you have plans to getaway?